SAN DIEGO–October brings the dark comedy HIR to Cygnet Theatre next month. This uncurbed, kitchen-sink drama about a family in transition was named The New York Time’s Top Ten Best Theater of 2015. Written by playwright and performance artist Taylor Mac and directed by Rob Lutfy, the production runs October 3 to 28. Somewhere in the suburbs, Isaac, a veteran, has returned from Afghanistan to help take care of his ailing father, only to discover a household in revolt. The insurgent: his mom. Liberated from an oppressive marriage, with Isaac’s newly out transgender sibling as her ally, she’s on a crusade to dismantle the patriarchy. But in Taylor Mac’s sly, subversive comedy, annihilating the past doesn’t always free you from it. 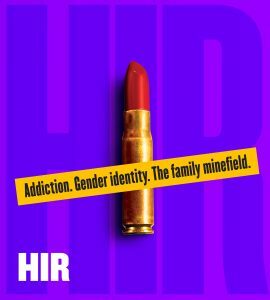 Since it’s premiere in 2014 HIR has had 48 different productions around the globe, including Steppenwolf Theatre, Wooly Mammoth Theatre, and The Belvoir (Sydney, where it received the Sydney Theater Award for Best Play of the Year). Those familiar with Taylor Mac’s work know they should be prepared for anything and everything. Mac, who goes by the gender pronoun ‘judy’, is best known for outrageous drag performances including the award winning 24-hour long 24 Decade History of Popular Music. Mac is a MacArthur Fellow, a Pulitzer Prize Finalist for Drama and the recipient of multiple awards including the Kennedy Prize, a NY Drama Critics Circle Award, a Doris Duke Performing Artist Award, a Guggenheim, the Herb Alpert in Theater, the Peter Zeisler Memorial Award, the Helen Merrill Playwriting Award, 2 Bessies, 2 Obies, a Helpmann, and an Ethyl Eichelberger Award. “The title, pronounced HERE, is a third gender pronoun that combines “his” and “hers.” The pronoun isn’t commonly used anymore but Mac liked the double meaning,” Director Rob Lutfy said. “It’s a play about HERE. Home. And what home means. What responsibility do we have to something or someone that has been abusive to us? How do we create boundaries? How do we heal when our politics divide us?” The matriarch of the family is played by DeAnna Driscoll (Paige). Driscoll was last seen at Cygnet in The Effect of Gamma Rays on Man-in-the-Moon Marigolds, for which she won the 2017 San Diego Critics Circle Award for Best Female Lead Performance of the Year. The rest of the cast are all new to the Cygnet stage and include Avi Roque (Max), Joel Castellaw (Isaac) and Dylan Seaton (Arnold). The production features Set Design by Sean Fanning, Lighting Design by R. Craig Wolf, Costume Design by Shirley Pierson, Wig & Makeup Design by Peter Herman, Sound Design by Mason Pilevsky, Properties Design by Bonnie Durben. Marie Jahelka will stage manage. Cygnet Theatre has partnered with the San Diego Community LGBT Center throughout the run. Tickets may be purchased in person at the box office, located at 4040 Twiggs Street, in San Diego Old Town Historic State Park, call (619) 337-1525, or visit www.cygnettheatre.com.